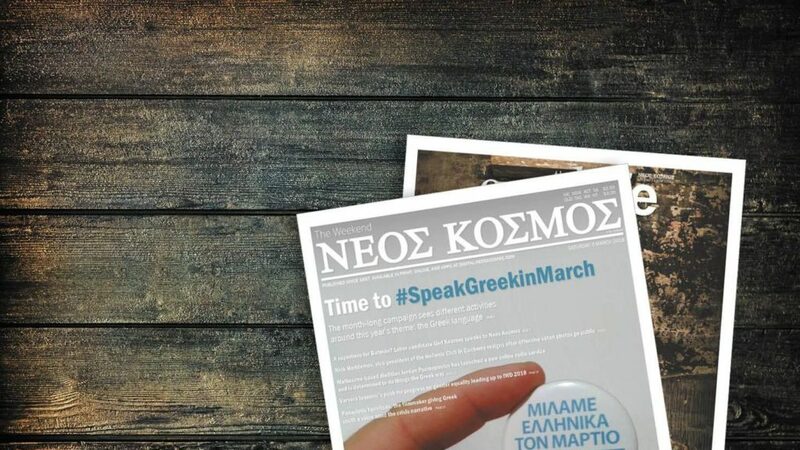 Last year Speak Greek in March was a cover story for Neos Kosmos. … και όχι μόνο’ and now that the Greek Diaspora is called to celebrate the International Day for Greek Language, the campaign could not be absent from the celebration. On Saturday 9 February, 6pm, the campaign hosts an event at the Greek Centre (168 Lonsdale Street), launching two new initiatives. During the event, Dr Georgia Nikolaidou from the Greek Consulate will deliver the official address, and two students of Greek, Anna Alexopoulou and Niki Tzempetzi will be awarded with a scholarship, which covers their 2019 tuition fees. “We would like this to be an annnual scolarship, offered to many more students and particularly those who can’t afford Greek school,” says Mr Mike Zafiropoulos AM, who conceived the campaign. The second initiative of the ‘Speak Greek in March’ campaign will be the launch of a new application for smart phones and other devices, called Metropolis. “It is a game, for children between 6 and 12 year old, aiming not only to entertain, but also to give children the opportunity to learn things about Greek language,” Mr Zafiropoulos explains, stressing that the app is addressed to children not only from Australia, but from the whole of the Greek diaspora. The app is still under development and will continue to be updated after Saturday’s launch. It is developed by one of the Greek Australian community’s brightest minds, 18 year old Fotios Tsouklas, who excels in technology and start up enterpreneurship since his early teens. “I approached him to do an application in Greek and what we do is adapt one of his previous applications to Greek, and to what we wanted its content to be,” Mr Zafiropoulos says. Satisfied with the response the campaign has been met for the past five years, Mr Zafiropoulos describes it as a “marketing ploy” aiming to start a discussion about Greek learning, trying to motivate schools and organisations. He offers one example of his own experience, as a member of the Frontida aged care board, when it was decided that the meeting should be held in Greek, in alignment with the campaign. “While a board meeting requires using specific terminology, we managed to speak Greek,” he remembers.